Being called back for further testing after a routine screening mammogram can seem alarming. While it’s very important to follow up and have the recommended tests, being called back after a mammogram doesn’t necessarily mean there is anything wrong. Bridgette Lord, a nurse practitioner at the Peter Gilgan Centre for Women’s Cancers at Women’s College Hospital, works closely with patients undergoing additional radiological testing for breast concerns. She understands that it is common for patients to experience anxiety and uncertainty during this time period. Helen Mark who has also worked as a nurse navigator at the Henrietta Banting Breast Centre also agrees that it can be helpful to know what to expect after being called back after a mammogram. When you’re called back after a screening mammogram, “in most cases it means the radiologist wants to take a closer look at something so they can determine if there is something to be concerned about or not,” says Mark. This is especially true if it’s your first mammogram. When reading your first test result, the radiologist has no previous images for comparison. That means they can’t tell if something on the image is new, or if it has changed. Calcifications are a good example. Calcifications are tiny specks of calcium that are sometimes benign, but are sometimes associated with tumors. Calcifications that are new, that have increased in number, or that are clustered together in a concerning pattern would warrant a call back for a closer look. “If it’s a woman’s first screening and we see calcifications, that person would be called back because we don’t know if they were there before,” Mark explains. If those images don’t provide enough information, a biopsy might be requested. A biopsy is done by inserting a needle into the area and drawing out a sample to be tested. Ultrasound imaging – or in some cases mammography – is used to guide the needle to the correct spot in the breast. Another appointment may need to be booked in order to do the biopsy. Magnetic resonance imaging, or MRI, is sometimes used for diagnostic breast imaging, but it isn’t used for screening except in high-risk women, such as those with BRCA1 or BRCA2 mutations. It is used for high-risk women because they often begin screening at a much younger age. Because breast tissue is displaced by fat as women get older, young women’s breasts are often much denser than older women’s. It’s understandable that women may be concerned and have questions when they are called back after a mammogram. Mark encourages women to ask for information at every step of the process, starting with when the callback appointment is arranged. Aside from the radiologists, there are several people in the Breast Centre who can help patients gain a better understanding of why they are being called back. 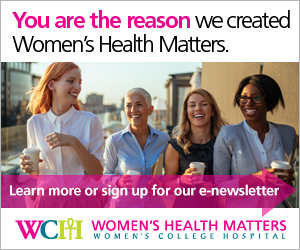 At Women’s College Hospital, there is both a nurse navigator and nurse practitioner available to support patients during this process. Primary care providers also have results sent to them and can explain why patients are being called back. It’s important to draw on the expertise of everyone inside the circle of care to gain access to education and help with navigating the process.